In a large bowl, gently combine shrimp, crawfish, green onion, celery, mayonnaise, lemon zest and juice, parsley, thyme and Cajun seasoning. Taste and adjust seasoning as needed. Cover shrimp mixture, and refrigerate until chilled, about 30 minutes. Brush interior of buns with melted butter. In a large skillet over medium heat, add buns, butter-side down, and cook until lightly browned. 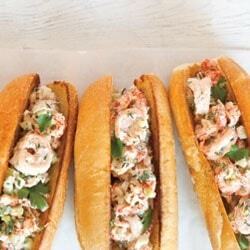 Divide shrimp mixture evenly between buns, and serve garnished with parsley, if desired.